Braintree Quilters has been running for one year now! Yippee!!! 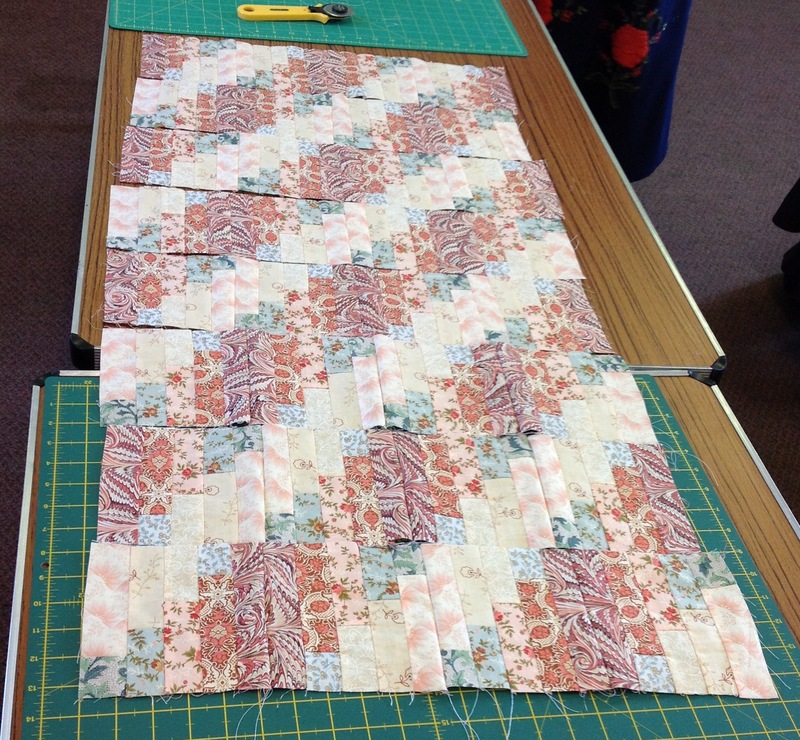 Over the year we have welcomed ladies who had never quilted before, so our numbers swelled! At our initial meeting we agreed to attempt a group quilt after our first year. As we meet in St Peter’s Church Hall we decided to challenge ourselves to make a quilt that the church could raffle at their summer fair. We really hope it will help generate more cash for their church projects. Several of us met up just after Christmas to choose a fabric that would be the main one running through the design. We chose the dark green marble fabric, hoping it would appeal to both men and women. Everyone who attended our meeting today set to work with enthusiasm making two “Cross Roads to Jericho” blocks. 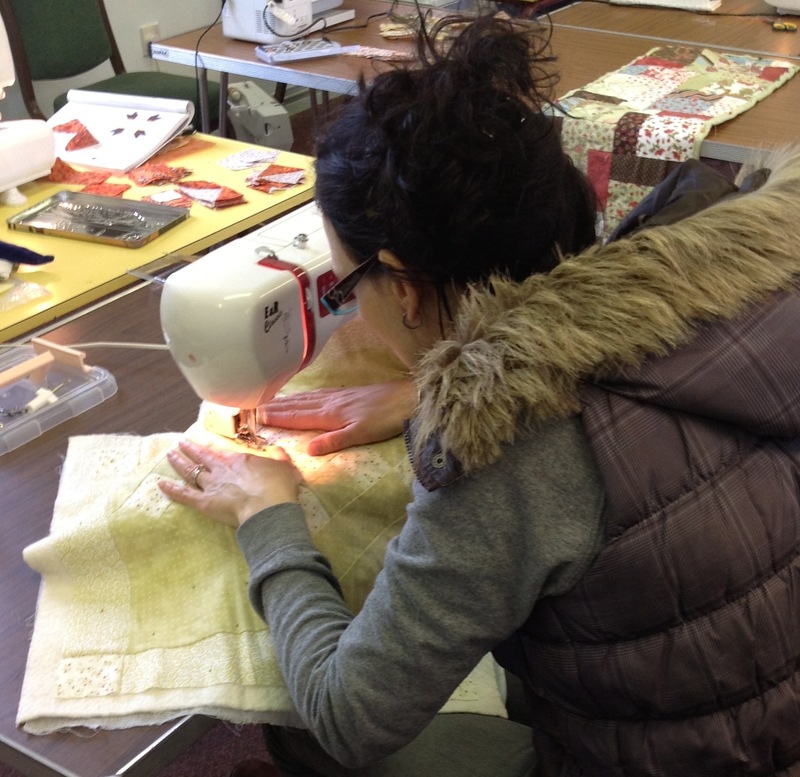 Grace chose the biblical block, as the most suitable one for all our members to sew. To create each block Sheila gave everyone five of the 2 ½ inch green marbled fabric squares. Then we used our stash scraps to make the arrows. 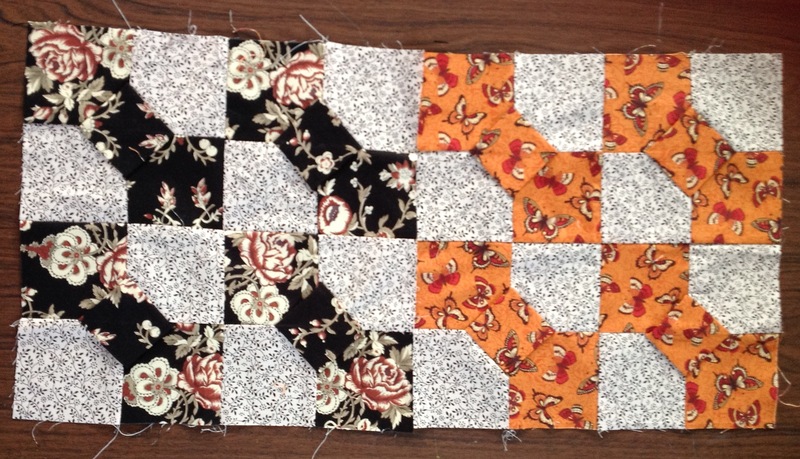 Each finished block is 9 inches square. As we finished our blocks we placed them on the tables and watched the design grow. It was exciting to see what it looked like. Then we started moving the blocks around to see different effects. Look how your eye follows the green squares up and down, side to side, all in lines! Wow, it will look good when it is pieced together. We have four more blocks to make before we can begin to think about adding the borders. I hope you like the beginnings of our charity quilt. If you have any ideas how to ensure lots of local people see our quilt, which would help raise even more money do let me know! Another busy week for us all! Some club members were making a carry tote for their cutting mats and rulers. 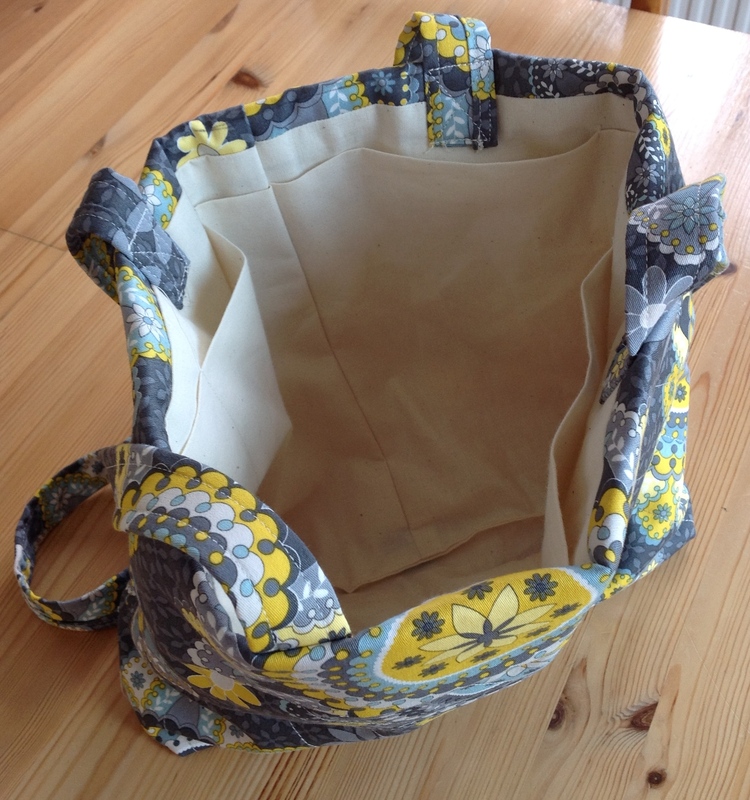 I am very proud that they have chosen to use one of my own knowhowtosew.com patterns. Members will all be able to personalise their totes to ensure they fit their own rulers and cutting mats. Launa is quilting the outside of her tote. It will be a lovely bright tote, as she is using some of the cotton fabric her Mum bought in India. Linda and Diane were in great discussion about Linda’s quilt top, which is absolutely beautiful. During the day Linda busily pinned the wadding and backing on. Grace is hooked on attic windows! 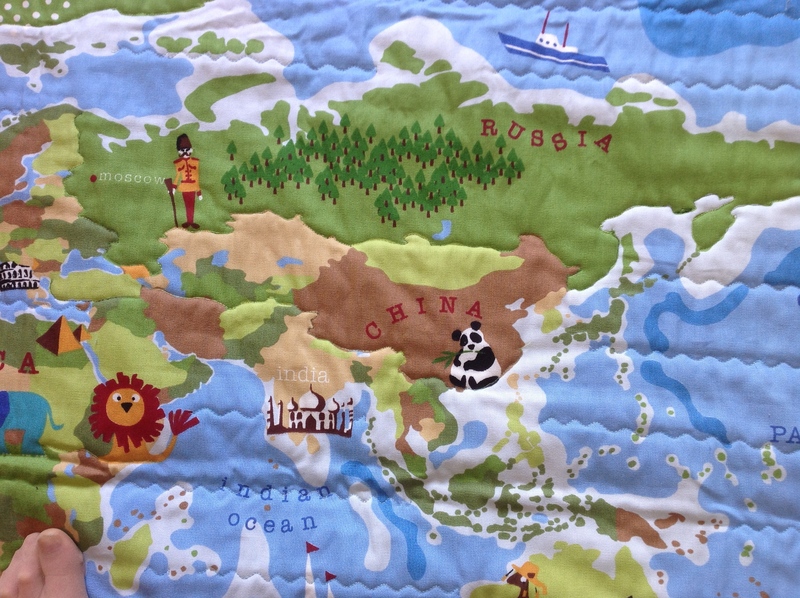 She has chosen to use the fabric she bought in Australia and New Zealand. There will be lots more photos in the weeks to come as she works on it. 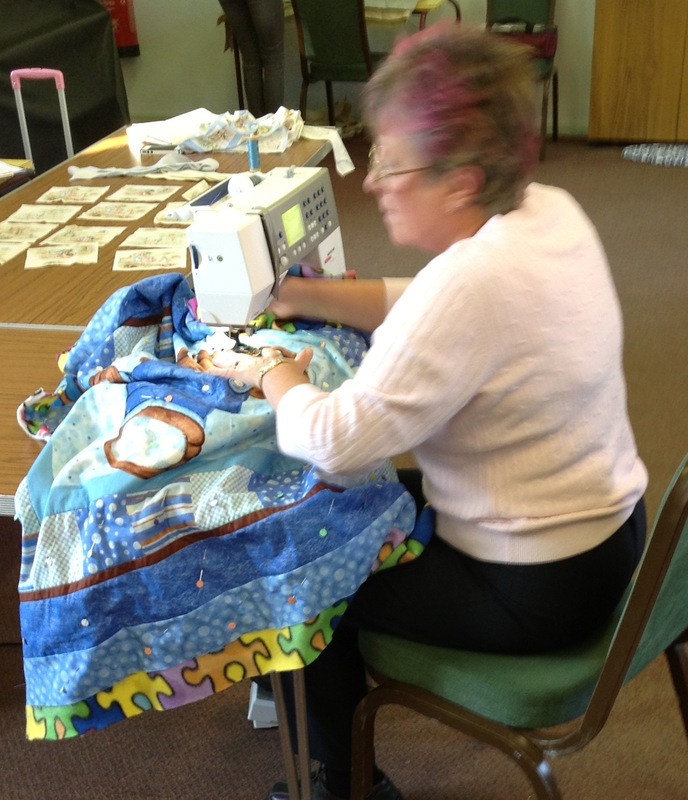 Pat, one of our newest members, is busy hand sewing her cushion top. We have enough members now to start a waiting list, which is very good for a club that is only four and a half months old! Friendships are being formed as we sit, sew, quilt, hand stitch and chat! Happy sewing and quilting to you all! This week we all worked on our own projects. Launa finished her cushion. She finished the back neatly in an envelope style. This is the first time Launa has ever quilted, she worked carefully and her cushion is very good. She also finished her cathedral windows pin cushion and bought it along to show us all. Sheila bought in a picture of the seaside. She made a hanging sleeve to go on the back. Linda made some kaleidoscope circles. They will be backed and made into table mats. In June our meetings will change to the second Wednesday of every month and the fourth Monday. If you would like to join us for both days or just one each month, please contact us by email using the contact page. Those who are beginners, or experienced at quilting, are very welcome. We have had another fun and productive meeting. Everyone worked on their own project, with lots of happy chatter in between. Everyone’s UFOs are very different and individual, leading to lots of oohs! and aah! Many of us are travelling to the Duxford show this week, all determined to see what is new. Launa was busy learning to quilt her first cushion. Linda was working on a gorgeous teddy panel. She backed it with a brightly coloured fleece. 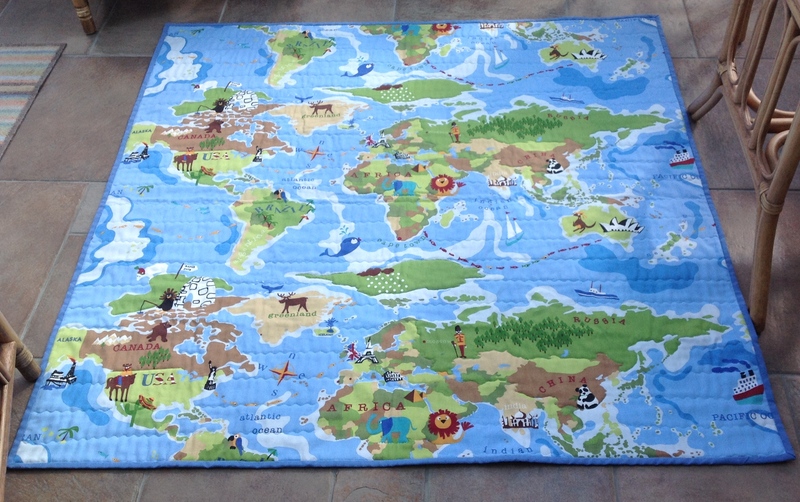 The fleece was in a jigsaw design. Grace was working on her tablecloth. She cut and then sewed more blocks so it gradually increased in size. Its a lovely pattern, shown off in such beautiful fabrics. 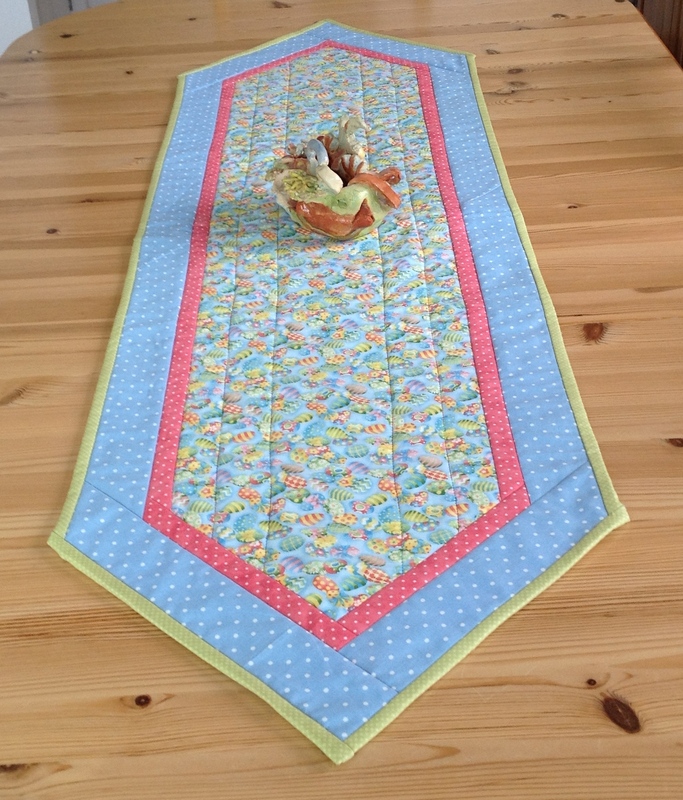 Mandy was finishing her table runner, sewing the binding takes a long time to finish neatly. We had a visitor to our meeting who wanted to see what we make. She is hoping to join us next week. We still have a couple of places if you would like to quilt and sew in the company of like minded ladies. We all enjoyed our third meeting together yesterday! Work in progress was the order of the day and everyone was kept very busy. Its lovely to be able to work on large tables with space to spread our work out. Diane is making large blocks for her sampler quilt. She has sewn two Bow Tie quilt blocks, which were beautifully pieced together. 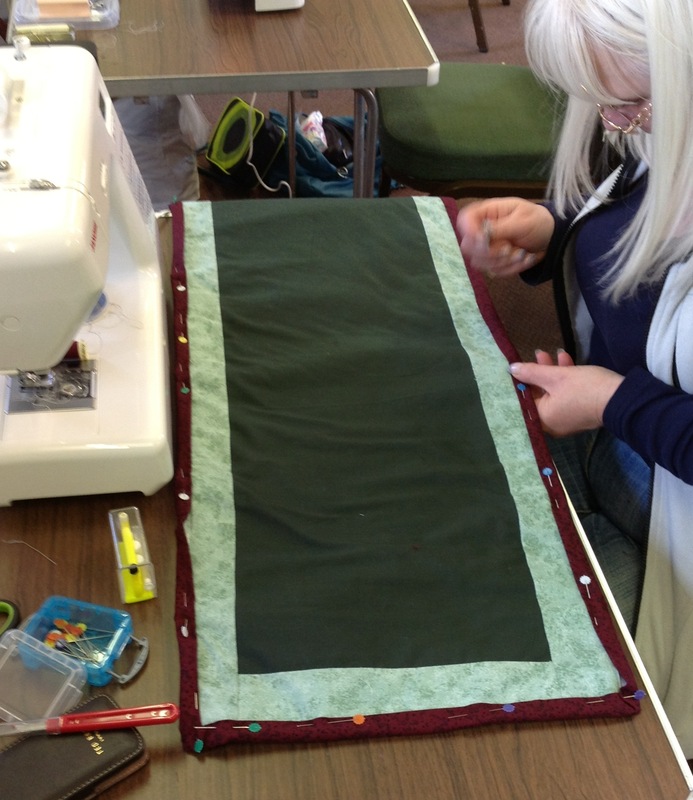 Mandy started to bind her table runner using the dark maroon material matching her small triangles. It was super to see that she had incorporated her three kaleidoscope patches she made at our last meeting. 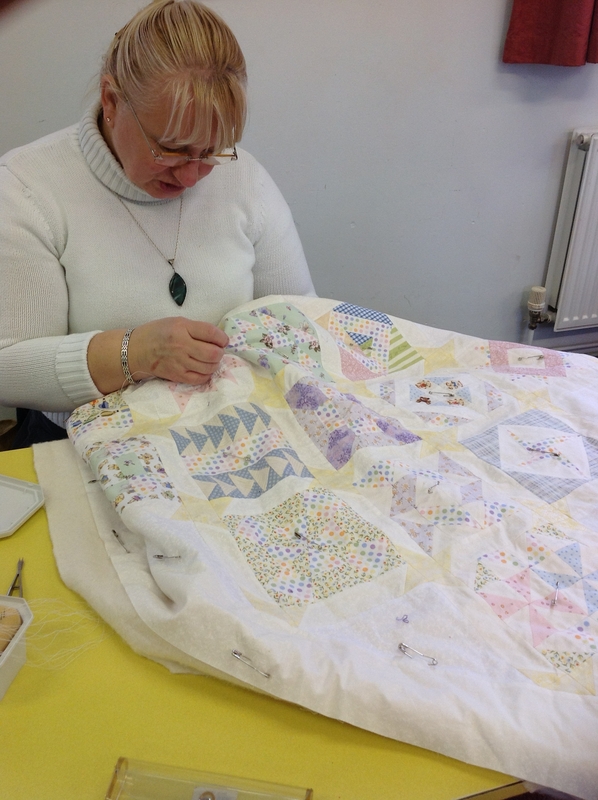 Whilst Janet continued to hand quilt her beautiful baby quilt. We are a new club and still have a couple of spaces if you would like to join us for a days quilting on a Wednesday, beginners or experienced quilters are welcome. 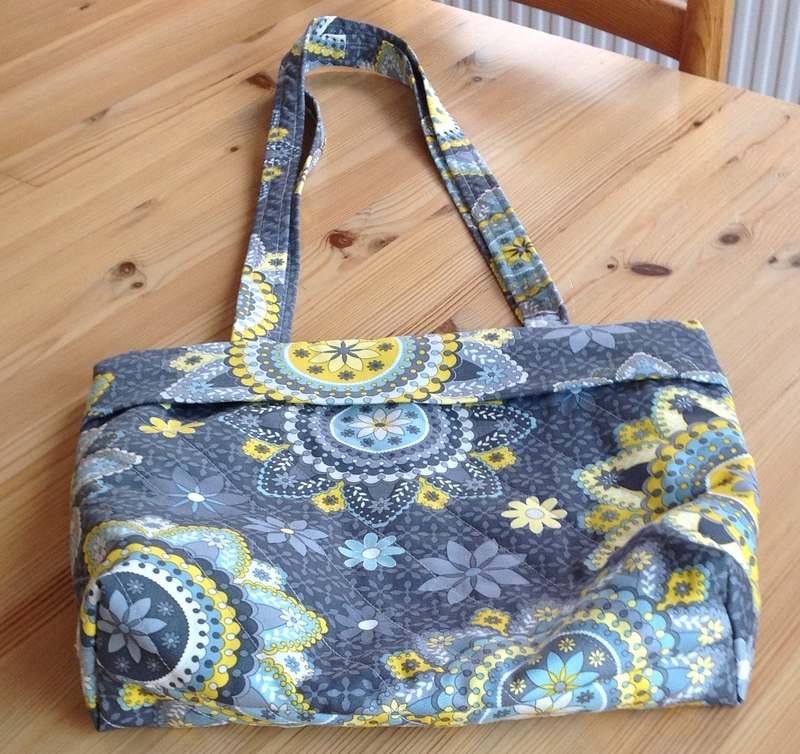 For more details look at our Braintree Quilters page. 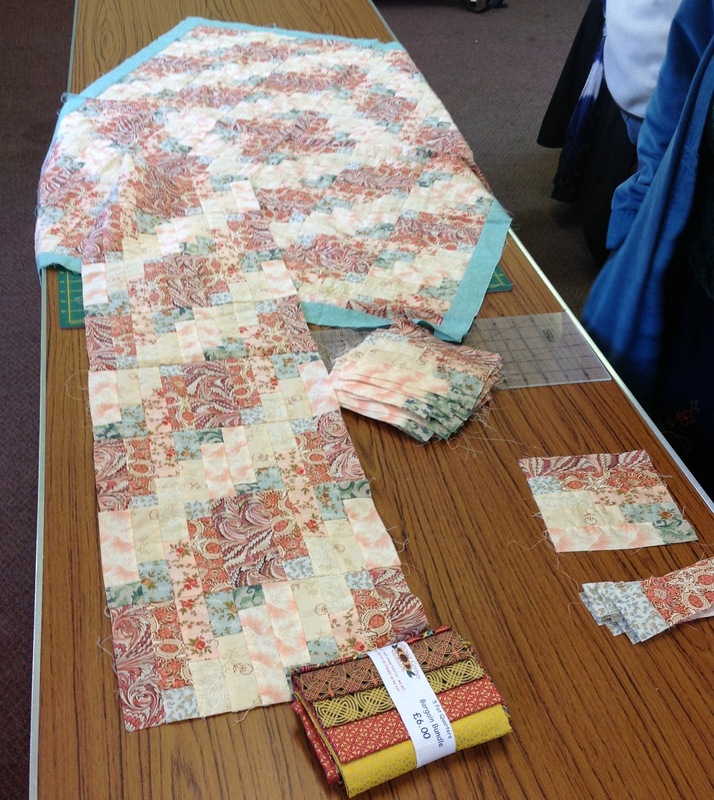 Our new Quilting Group has got off to a flying start. We have nine members, but would like a few more. We worked on our kaleidoscopic blocks this week, led by Grace. The initial cutting of the fabric needed care and precision, but then the fun began. Circles were laid out for all to see before sewing commenced. Those of us who joined in finished at least three or four circles in the time. Others worked on projects that they wanted to finish.